Montgomery County police detectives obtained a warrant Wednesday for a 27-year-old woman who disappeared shortly after her two young children also went missing. 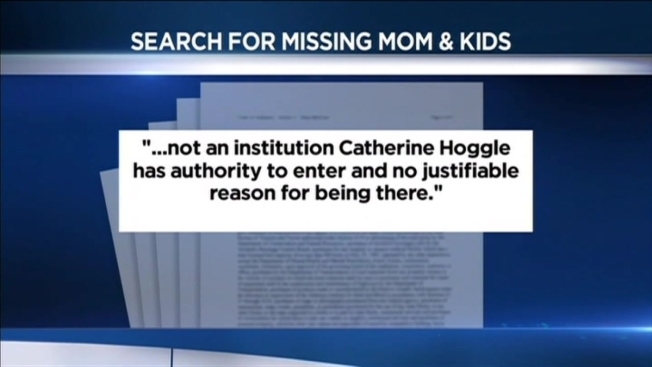 The warrant charges Catherine Hoggle with two counts of misdemeanor child neglect, which each carry a maximum penalty of five years in prison and a $5,000 fine, according to Montgomery County police. Hoggle's 2-year-old son, Jacob Hoggle, was last seen at his grandmother's Gaithersburg home Sunday afternoon. 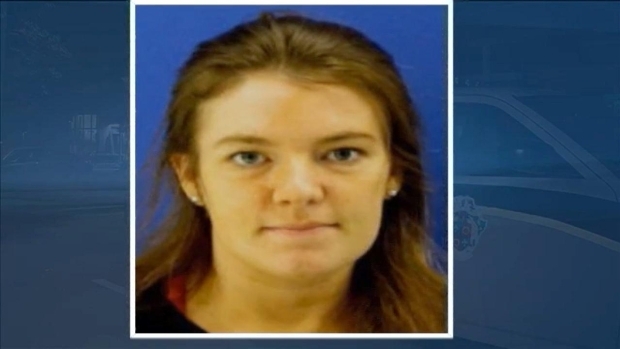 Her 3-year-old daughter, Sarah Hoggle, was last seen Monday morning at their home in the 12200 block of Elm Forest Court in Clarksburg, Maryland. Investigators searched the Seneca Creek Greenway Trail Wednesday afternoon but wouldn't say why. Catherine, whom police say has been diagnosed with paranoid schizophrenia, was last seen on surveillance video in the downtown Germantown area at 4:40 a.m. Tuesday. There have been no sightings of her children. Hoggle's common-law husband, Troy Turner, called police at 8 p.m. Monday to report that Hoggle and two of their three children were missing. Turner told police that while he was at work Sunday afternoon, Hoggle's father drove the family to Hoggle's mother's home in Gaithersburg. Hoggle then borrowed her father's car, a gray 2012 Nissan Rogue, and told her parents she was taking Jacob to get pizza. When she returned three hours later, she did not have any food or her son with her. Hoggle told her parents she dropped off Jacob at a playmate's house and went back to her own home with Sarah. Police determined Monday night that Jacob had never been at a friend's home. Detectives are still working to determine where Catherine's other son was at this time. Montgomery County police are investigating the strange disappearance of a woman with schizophrenia and two of her children, each at different times over two days. At 5:50 a.m. Monday, Hoggle left her Clarksburg home with Sarah, telling Turner that she was dropping off the girl at a daycare center. When she returned home at 8:30 a.m., she told Turner that she had taken both Jacob and Sarah to the unknown daycare. Police say that Turner, who works nights, never knew that Jacob hadn't returned home from his grandmother's house. Monday morning, Turner took their third child to the bus stop. Turner then dropped off Hoggle at a medical appointment at 11 a.m. and picked her up a few hours later. When he asked about picking up their children from the daycare, Hoggle would not tell him where they were. He decided to go to the police for help, but first, the couple stopped at a Chick-fil-A in Germantown. Hoggle slipped out of the restaurant unnoticed, and Turner called police. Police say a K9 unit tracked her to the area of the Germantown Transit Center at 19945 Aircraft Drive. She was then seen on surveillance video in the arrea at 7:15 p.m.
At 4:40 a.m. Tuesday, Hoggle was captured on video in the area of Route 118 (Germantown Road) between Interstate 270 and the Germantown Commons shopping center on Middlebrook Road, police said. She had no authority or reason for being there. Her purse and credit cards were found there. Last year, Hoggle filed a complaint against a relative that included page after page of minute detail about the alleged theft of used clothing, News4's Jackie Bensen reported. Called "excessive writing," it is considered a symptom of schizophrenia. "We are about 1,300 strong on the police department, of men and women on the street," said Montgomery County Asst. Police Chief Russ Hamill. "We need the eyes and ears of the community to help us find these little children and bring them safely home." Police are searching for a woman and her two young children. Each disappeared at different times over a two-day span in Montgomery County. News4's Pat Collins reports. Catherine Hoggle is 5-feet-6-inches tall and weighs 160 pounds. She has brown eyes and black hair. She was last seen wearing blue jeans and a black tank top. Sarah Hoggle is biracial, 3-feet-6-inches tall and weighs 40 pounds. She has brown eyes and brown hair. Her brother, Jacob, is also biracial, and is 3 feet tall and weighs 25 pounds. He has brown eyes and a blond afro. Investigators believe the children may be with a friend or someone known to Catherine who does not know the police are looking for them. If you have seen Catherine Hoggle, Jacob Hoggle or Sarah Hoggle, police ask that you call 911 immediately.